A BIG thankyou and BIG things in store for my newsletter subscribers! As the current Stampin' Up! year draws to a close and the new 2008/2009 Idea Book and Catalogue starts tomorrow, nows a good time to tell you about a few changes I have in store. I have been thinking about a way to say thankyou to my loyal customers and my loyal newsletter subscribers and those who refer other customers my way, or people to my blog. So, commencing from April (that's tomorrow!) 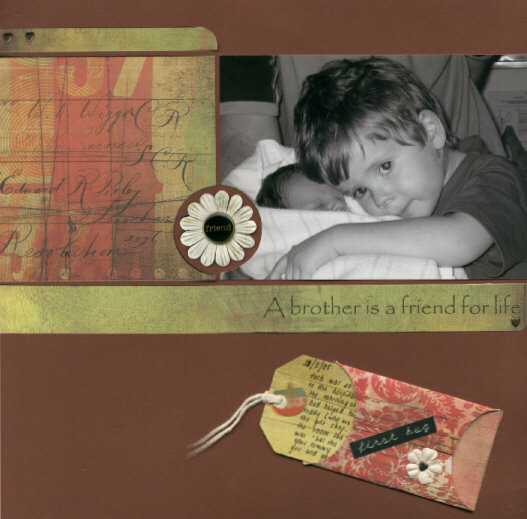 I will be 'spreading the love' around a little and providing extra value and services JUST for those who choose to subscribe to my blog newsletter, and especially those who choose to buy their Stampin' Up! products through me. As a Customer of course you will receive the highest level of freebies, competitions, specials and offers, to say thankyou for allowing me to be the one to inspire you, and for you allowing me to develop a business where I can work from home and be here for my family. You'll be getting a special customer newsletter tomorrow, outlining what I have in store. If you're not a customer, you will want to be a Subscriber to my monthly blog newsletter. I'll be offering additional newsletter only samples, specials, services and advice. You wouldn't want to miss that, so make sure you subscribe to my blog newsletter today. If you are already a customer, there's no need to subscribe to the blog newsletter as you will automatically hear about these offers in the customer newsletter. I will of course continue to visit here too and provide samples and ideas and inspiration for you, but for the 'full package'. I actually feel really emotional today. 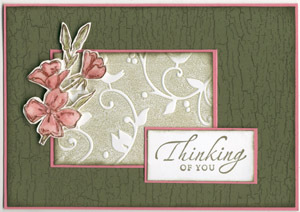 I think it's because today is the last day of my first full year with Stampin' Up! and I am in a place I never dreamed I would ever be. 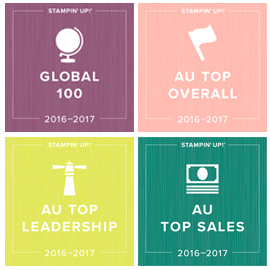 I have so many wonderful customers, fellow demonstrators (many who have chosen to join my team) and friends through the last 12 months with Stampin' Up!. I have contributed to the family income in a way that has been nurturing and flexible for my family, helped others to unleash their own creativity or in many cases rediscover it, and I have learnt so many new skills and achieved so many things that have bought me excitement and joy. It's a great place to be. 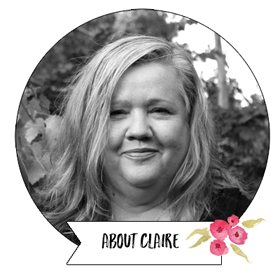 If you are reading this and you feel not quite sure what the year ahead has in store for you, but have a passion for stamping and scrapbooking, email me (I'll call you back) and let me take you on a journey as a member of my team. You will never regret it. Finally thankyou to everyone who has purchased their products through me this year, or already joined my team. This year I have also been one of the demonstrators who has earnt the 2008 Stampin' Up! Incentive Trip. This is rewarded for team leadership and business performance and is an all expenses paid 5 day holiday for 2 to Palm Cove in Queensland in August. Thankyou for contributing to that. 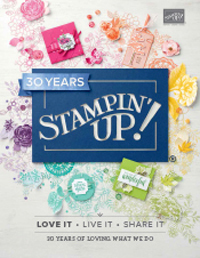 I'll make sure I brng back some extra special stampin tips for my customers! 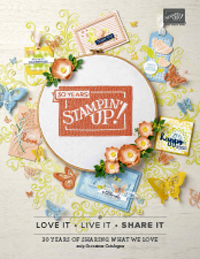 Next Thursday, I am off to Brisbane on the 'ultimate girls weekend' - the 2008 Stampin' Up! Convention in Brisbane where we will be inspired and motivated and rewarded. It's going to be so much fun! I'll be sure to post pictures for you! Happy Monday and thankyou again. 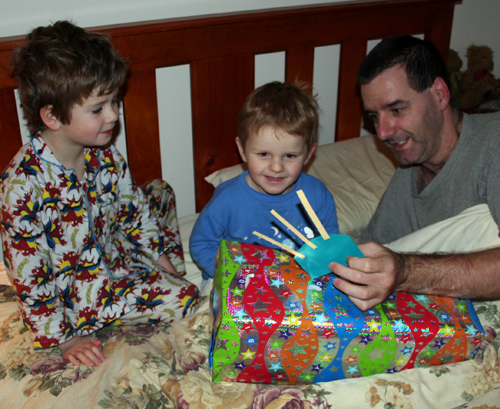 The card was a hit, as was the one made by his big brother. Josh (5) decided he wanted to make Sam a card in the shape of a birthday cake and he even asked me could he use my glitter to make the flames look better - a little artist in the making? You can see the blue card he made in the picture below. 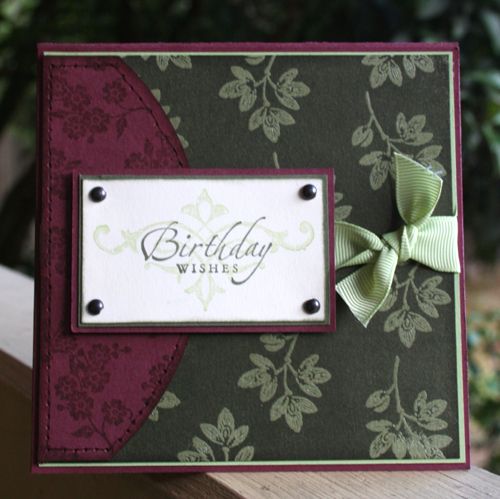 Back later with a Stampin' Up! post - new catalogue sales start tomorrow - WOOHOO!! My baby boy turns 3 today! Yes, this time 3 years ago, I was in the antenatal ward at Jessie McPherson 38 weeks pregnant with my second IVF baby. I had pre-eclampsia (which surprised us all as I didn't have it with my first child) and as I recall very hungry because they wouldn't let me eat in case I needed an emergency caesarian. They managed to get my BP down with medication enough to be induced though, though so my 'little' Sam was born 2 weeks early at a hefty 9lb 5oz (thank goodness he was early!). 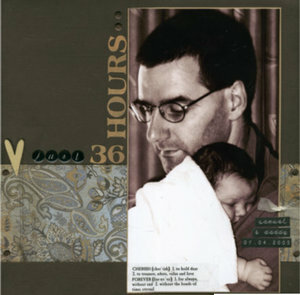 It seems like yesterday but there have been many fun, happy, exhausting and crazy days between now and then. 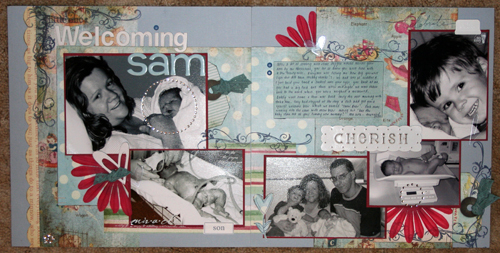 How I love my boys :) Here's the card I made for Sam last night. How cute is this dinosaur paper! Here's some of my older layouts of the very early baby days with Sam. It's so good to have them to look at now (so go on - scrapbook!). On that note, I had better get some sleep as the little birthday boy will be up bright and early to open his presents! Josh and I had fun choosing them, although I must say taking a child to a toy shop on a Saturday is not for the faint hearted! I normally would have had it all done and wrapped days ago, but the whole family ended up coming down with gastro last week including poor Mum. Until the new catalogue launches! Too exciting. I have been feverishly working on my wish list for new sets and accessories and can't wait to bring them to you. Speaking of sleep, I have had little. Just when Josh recovered, Sam started vomiting, so it's been one of those weeks. Apologies that I am a few days behind with things. I am trying to catch up. The rain has been lovely hasn't it. Much needed and I hope it's getting to where it's needed the most. Here's a couple of cards I managed this week in between loads of washing and dishing out lots of mummy hugs. This one is Carte Postale done a little differently with emboss resist technique. 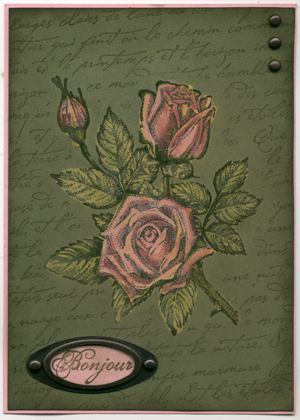 The colours are Bravo Burgundy, Mellow Moss, Certainly Celery with Always Artichoke brayered over the clear embossed background (which was stamped onto Mellow Moss). 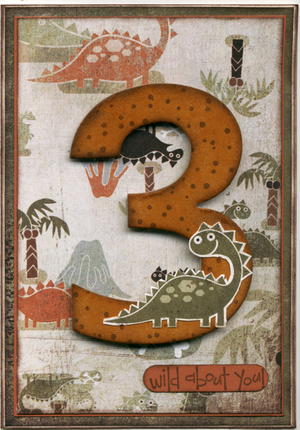 Have also 'stamped off' which basically just means stamping once on scrap paper and then onto your card with the second stamping (without re-inking). This one is Natural Beauty and was made to highlight the Spotlighting technique. The butterfly is watercoloured and then covered with Crystal effects for shine and dimension. Love the effect that gives! 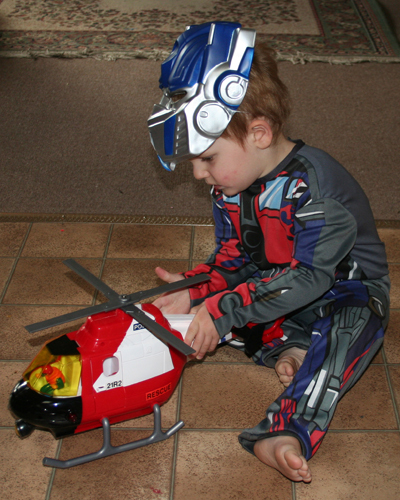 Easter Bunny day was a bit of a let down for DS5 - he has been unwell with nausea and vomiting for most of the day and the last thing he wanted was Easter Eggs. Poor thing, and he was so excited. I assured them they will keep (mental note not to eat my son's easter eggs!). So consequently I have spent today quietly at home with him while my husband took my younger son (who delights in jumping on sick brothers) out visiting for the day. Josh slept for much of the day so I tried some new techniques on some cards. This first one was made my bleaching out the colour and then watercolouring. I really like the effect it gives on dark cardstock. 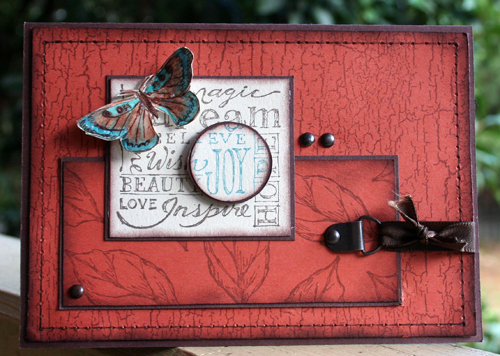 This one (which was the technique of the week on SCS) was done by inking up the negative side of my Cuttlebug Embossing folder (the smooth debossed side with the name on it). I brayered the ink on and then embossed the cardstock like normal. Hope you are all well and happy and not feeling the results of too much easter chocolate! I was very good and limited myself to one bunny made of scrumptiously decadent dark chocolate.